Several weeks ago, I went to my very first pop-up shop since moving to New York. Martha Stewart opened up a weekend pie and tart shop to celebrate the release of her new cookbook, Martha Stewart’s Pies & Tarts. Sadly, there was a one-pie-per-person limit. There was a lot of pressure in making just the right choice. After no small amount of deliberation, I chose this Chewy Chess Tart. Chess pie was my favorite pie for most of my childhood. I never had any idea what went into one. I just knew I liked it. Now that I consider myself somewhat of a baker, I am fascinated by this pie and its simplicity. How is it possible that sugar, butter, and eggs can evolve into something so amazingly good? 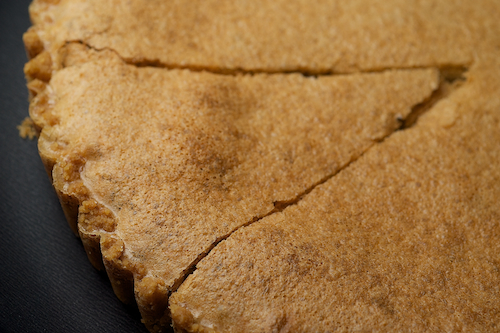 This pie tastes far more complex than its list of ingredients might lead you to believe. The baking of a custard-like pie, however, can be a bit tricky. While I tend to like underbaking by a smidge, that is not the way to go with this one. If it’s not baked long enough, you’ll end up with a gooey mess. 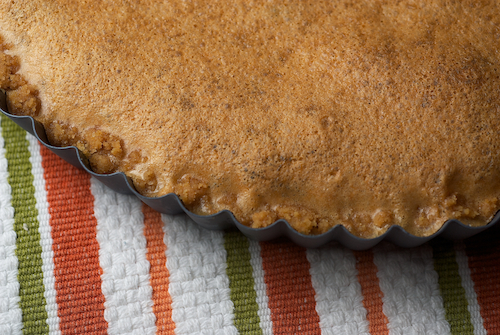 I am a big fan of this nontraditional (to me, at least) vanilla cookie crust. Honestly, if the pie doesn’t turn out just right, you could be content just eating that crust.